Train on the Liverpool and Manchester railway; the locomotive (Jupiter) was a Stephenson 2-2-0 of 1831. 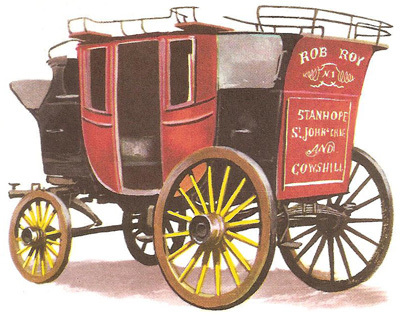 The coach, Rob Roy, ran from Leeds to Sheffield between 1835 and 1844 in conjunction with the new railways. 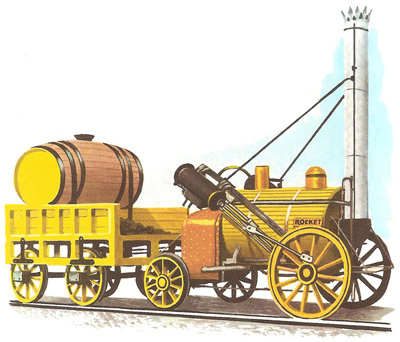 Stephenson's famous Rocket ran for six years on the Liverpool-Manchester line. It would be impossible to overestimate the part played by railways during the past century in the development of our modern way of life. In great part this is due to those pioneers who created railways as we know them today – to George Stephenson in particular. As a young man, he paid a shilling a week to learn to read and write. As an engineer he helped to make Britain one of the richest nations on Earth. To people who were superstitious, the opening in 1830 of what was to become the world's first regular passenger railway with all steam traction – the Liverpool and Manchester line – was a very inauspicious occasion. In the first place, the opening ceremony was marred by a severe thunderstorm. Then, shortly after the storm had died down, Mr. Huskisson, a well-known political figure, fell on to the railway line and was hit by Stevenson's famous locomotive, Rocket, and was fatally injured. The prophets of gloom were certain no good would ever come of this monster clanging steel and hissing steam. Like most prophets of gloom, however, they were wrong. The Liverpool-Manchester line set the pattern for the vast network of railways throughout the world, and it provided the efficient transport necessary for the tremendous industrial developments which were taking place at that time. At the time of the opening of the Liverpool-Manchester line the Industrial Revolution was in full swing, and transport was one of the foremost problems. Road transport was inadequate, painfully slow, and even dangerous. The system of canals, so hopefully completed shortly before, had far from fulfilled its promise. The Liverpool-Manchester line solved the problems of the industrialists of northern England and the railway era began. The idea of a permanent way designed to provide a solid surface for wheeled vehicles was actually quite an old one, and tracks sometimes of iron but more frequently of wood, had been in existence since the 16th century. Up to 1830, however, they had been confined largely to mining districts, and traction over them had been restricted in most places to horses. Steam power itself was not unknown either. James Watt and Matthew Boulton were producing excellent steam engines as early as 1774. But until 1804 such vehicles were mainly for use on the roads. The first man to think of applying steam power to lined ways was Ralph Allen. Unfortunately, his early attempt to run a steam locomotive on lines at Bath came to nothing. The next man to try the idea was Richard Trevithick, a Cornishman, and one of the great engineers of his day. In 1804 Trevithick put his first locomotive on to rails, naturally enough at a place where rails already existed – Penydarran, near Merthyr Tydfil, in South Wales. This was the first successful combination of railway lines and steam locomotion in the world. At its trials the engine ran on flanged rails, pulling ten tons of iron and seventy passengers for a distance of nine miles. Trevithick, brilliant though as an engineer, lacked perseverance, and his ideas were finally realized by another man: George Stephenson. The story of George Stephenson is in fact the story of the birth of the modern railway. Stephenson was born at Wylam, near Newcastle-upon-Tyne, on 9th June 1781. He was the son of a miner and entered the pits himself at an early age. At nineteen he was unable to write his own name. But Stephenson was no ordinary man: he paid a shilling a week of his hard-earned money to learn to read and write, and then set about educating himself. Stephenson was by instinct a brilliant engineer. He loved machines; he enjoyed nothing better than stripping down a machine and putting it together again; and his skill quickly earned him a reputation in the coalfield. Soon local pit-owners competed for his services and he was quick to grab every opportunity that came his way. At the age of thirty-one Stephenson found himself responsible for the engine equipment of a whole group of pits at Killingworth, and it was at this stage in his career that his influence on railway development began. Among the problems which faced him at Killingworth was the difficulty of transporting coal from the pit-heads to the river bank from whence it was shipped by barge. Stephenson decided that he would experiment with steam locomotion. Stephenson had always longed to build his own locomotive and had read all he could about those which had already been tried out. He set to work and by 1814 had built his first locomotive, the Blucher, which incorporated several original improvements in engine design. A year later Stephenson had yet another engine on the Killingworth lines, and this one provided the basis for almost every steam locomotive that has been built since. The success of the Killingworth pit railway greatly impressed a group of mine-owners and merchants who had been anxious to speed up transport between the coal regions of Durham and the distribution area of North Yorkshire, and Stephenson was invited to build a railway line from Stockton to Darlington, a distance of 36 miles. Stephenson accepted with enthusiasm. The only aspect of the job the job which didn't please him was the fact that the sponsors insisted on horses as the main form of traction. Yet Stephenson's arguments in favor of steam locomotives were not entirely overruled. A certain number of "traveling engines" were agreed upon, as well as stationary engines which would haul the wagons up difficult inclines by means of chains and pulleys. Stephenson intended to produce these engines himself and so he became a partner in a locomotive engineering works at Newcastle. The line opened in 1825, and proved a great success. Coal traveled along this line at a rate of 50,000 tons a year at an average speed of four to six miles an hour. At first, the Stockton-Darlington line was used only for goods traffic, but it was soon realized that it could also be very useful for carrying passengers. Coaches suitable for this were pulled by horses, whilst steam locomotives were reserved for the goods trains. While Stephenson was busy with the Stockton-Darlington railway, certain people in Lancashire were considering the proposal to build a line between Manchester, the region's great industrial center, and the port of Liverpool. A great quantity of the Lancashire cotton industry's imports of raw materials and their exports of finished textiles passed between these two cities and speedy transport was vital. A company was formed to promote a railway line in this part of the country and a preliminary survey was made of the route. Although industrialists were enthusiastic, local land-owners were not. The land-owners carried their opposition into Parliament and there was a series of hotly disputed bills before Government sanction was obtained for the building of the track. Once again, George Stephenson was consulted. Having finished his work in Yorkshire, he readily took command of the situation. Using nothing but human strength and skill, he began laying of the thirty miles of double track, one of the most ambitious engineering schemes that had ever been contemplated. For four years Stephenson's workmen moved slowly onward, leaving behind them, in addition to the line, many notable monuments. They built 63 bridges; at Olive Mount Cutting they went to a depth of 100 feet for two miles through solid rock. But their biggest achievement was crossing Chat Moss. Chat Moss was a huge bog that was impossible to drain; yet somehow, the line had to go across it, since skirting the edge of the moss would have increased the cost of the line to an impossible extent. Stephenson's solution to the problem of Chat Moss was simple but successful. He had noticed a local farmer crossing the bog by tying flat wooden rafts to his feet. Adapting this idea, he first put down a layer of dry turf. On top of this he placed hurdles, and on these hurdles he laid his track, thus floated, as it were, on the surface of the bog. This proved completely satisfactory and has ever since been regarded as one of Stephenson's most remarkable achievements. Even with the promoters of the Liverpool-Manchester line Stephenson had had disputes over method of traction. But this matter had finally been settled in favor of locomotives by the results of a competition held in 1829 (The Rainhill Trials). All the latest designs of locomotives were put on trial, including Stephenson's Rocket which took first prize and traveled at 29 miles an hour. This feat dispelled forever any doubts about efficiency of the "traveling steam-engine". A year later, after Mr. Huskisson had been hit by the Rocket at the opening of the Liverpool-Manchester line, Stephenson drove the fatally injured man at the amazing speed of 36 miles an hour to a place where he could receive treatment. In this way he achieved the first world speed record. Thus, on the 15th September 1830, the Liverpool-Manchester line was opened – the first ever to use steam locomotion throughout and the first to have regular passenger service. The networks of railways today, not only in Britain, but throughout the civilized world, owe their inspiration to businessmen such as those who sponsored the lines at Stockton-Darlington and Liverpool-Manchester, and to the great engineers like Trevithick, Allen, and Stephenson. These men have their memorial in every railway line, all of which had a common origin in the coal mines of Durham and Wales and in Stephenson's little Rocket chugging noisily across Chat Moss.